You show up at the other parent’s house to pick up your child for the weekend and nobody is there. What do you do? You call the police and tell them you cannot find your child and it is your time to have them. If your child is missing and the other parent has the child, you might not get much help from the police unless you tell them that you believe your child is in danger or that the other parent has no custody of the child at all. What if you show up and your child is there with the other parent but the other parent refuses to give you the child? You call the police. What the police do in your state is going to be different from state to state depending on the wording in your state statutes. You might find a police officer that tells you that it is a civil matter and to contact your family court. Or your police department may be one of the rare few that actually enforce the criminal code in your state regarding custodial interference. What is Considered CHILD CUSTODY INTERFERENCE? I’m sure you’ve heard Amber alerts where a parent has abducted a child and the police are looking for them. Did you wonder what it took for things to get to that point? How is it that a parent could be charged with kidnapping their own child? Is this really a thing? How do I Enforce my Child Custody Order? Custodial Interference is when “a person knowingly takes or withholds a child from the custodial parent entitled to possession of the child at the time.” We wondered what that would look like in practice. When was a parent charged with interference with child custody? When a child custody order is created, it is created in the best interest of the child, right? So if a parent violates this order wouldn’t they be violating the best interest of the child? If your judge decided that it was in your child’s best interest to be with you on particular days for a particular amount of time and the other parent decides they are not going to surrender the child to you, not only are they disrespecting a court’s order, they are interfering with what the judge decided was best for the child. Look for the laws regarding “interference with child custody” in your family code and in your criminal code. 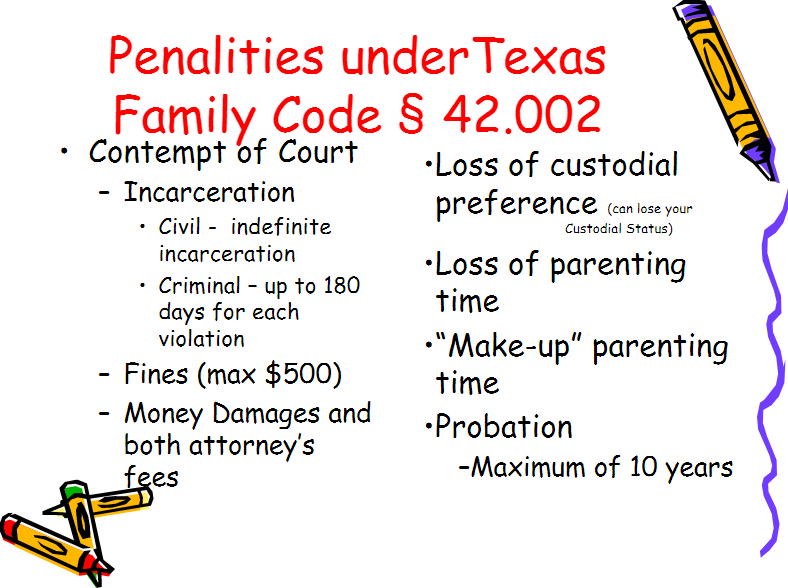 Your family court enforces the civil family code sections and your local law officials enforce the criminal codes. If a parent and child cannot trust that their orders will be upheld and enforced, what happens? Well word will get out that court orders are useless, children will have no protection from parental disagreements and their relationship with the other parent will not be protected. When people lose trust in the courts they stop using them. When people stop using the court this can lead to some very bad decisions and unpredictable results. This is very bad for society as a whole. 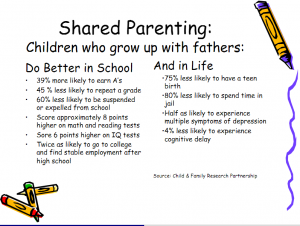 Parents and children need to be able to depend on consistent and predictable results. Most states have a public policy that the child’s relationship with the other parent is to be protected. Parents and children need to be able to depend on their custody orders. If the first responders do not enforce these orders, the orders are useless. Parental conflict can escalate and domestic violence can result. Children can suffer parental alienation and parent-child bonds are destroyed. The courts take too long and are too expensive. Parents pay good money to get these orders to protect their child to their relationship and time with them. You might have spent $30,000, $100,000 or even more getting custody orders in place. Once that is done you probably thought the battle was over and if the orders weren’t followed that the police were going to take action against the parent violating the orders. When a police officer and the district attorney do not enforce these orders in an expedited fashion, these state actors are not only failing to protect the best interest of the child in violation of your state’s public policy, but are also creating mistrust and dissatisfaction in the parent who is suffering the loss. This mistrust and dissatisfaction can transfer over to the child not getting to see their other parent. As that child ages they will know that the law does not respect court orders and could translate this as court orders are pretty much useless unless you are rich and lucky. If a parent has to go back to court after already going bankrupt just to get the initial custody order in the first place, that parent and child could be cut off from each other purely because of financial reasons. Child custody is not supposed to depend on a parent’s financial status. It is criminal to interfere with a custody order. By enforcing these criminal laws, your state reduces the burden on the parent suffering the violation and protects the child from prolonged separation from their parents and prolonged litigation. Enforcing orders immediately simplifies life for everyone, reduces the likelihood of child abduction, parental alienation, and parental conflict, and increases the trust and confidence in court orders. This is beneficial to everyone in a lawful society. When parents lose hope in justice, society suffers. When parents and children are confident that they will be protected, their overall confidence increases and so does their happiness. Research to determine the attitude of the local police, district attorneys, and attorney general in your state surrounding enforcement of custody orders by police and district attorneys is necessary to determine whether you need legislative action to encourage compliance with court orders. WHAT ARE SOME OF THE COMMON EXCUSES USED TO DENY ENFORCEMENT BY LAW OFFICIALS? If you run into the objection that they don’t believe a parent should be put in jail, ask whoever is saying that, if the parent robbed a bank or murdered someone, would they throw them in jail? Custody interference laws should not be treated any differently. Some law officials might say that they don’t know whether the other parent has a valid reason for denying you custody of your child. Ask the peace officer if the other parent is supposed to have the power and authority to violate the court order? And you can ask them whether that excuse qualifies as a valid rebuttal to the law that applies to enforcement of your order? Where does it say in the law that they are to consider an excuse for the other parent refusing to surrender the child to you during your time? Some police officers will let the resisting parent know that they are supposed to go back to court and let the court know if they want to change the father’s access to the child. Don’t stop there. Do not be discouraged, keep reading. You can remind the law enforcement that all objections were taken into consideration by the judge during the trial and the judge made that order according to each side’s objections, and that it is not the job of the police to second guess the ruling of the judge. Show them the language in your order that says that they are to enforce, if your order has that language. If the other parent says that the issue arose after the court order was created, then remind the police that the parent had a duty then to inform CPS, the police, and to file with the Court, all or whichever one is relevant. Remind them that the parent can file an ex parte emergency motion with the court and get an order same day in some cases. If they did not do any of this and did not obtain a new order then they must be held to following the order that is in place. Don’t stop here either. Look at the very next paragraph. What Can the Police Do to Help Encourage Compliance with Visitation Orders? Some police departments are starting to warn the parent refusing to give the child to the other parent that they are in violation of an order, breaking the law, and that they could and will be taken to jail if they do it again. This has been extremely effective. This is much more effective then just telling the parents that it is a civil matter and to take it back to court. In the past, parents were not threatened with arrest, and were not arrested. And when the parent losing time with the children was not able to afford going going back to court they were subject to de facto losing their child. Most police will tell you that they are frustrated and that they would like to help you more. So if they tell you that all they can do is a welfare check, skip down to “How Does the Program Work” section and ask them if they can help you get that going in your area. What Can the D.A. do to Help Encourage Compliance with Your Parenting Plan Order? If you want your D.A. or State’s Attorney to enforce your order you have to provide them with incentive. First, your state would have to have a statute that says interference with child custody is against the law. Even if withholding your child from you against a court order is a violation of the order, you still need a state law that they are violating in order for the D.A. and the police to enforce. 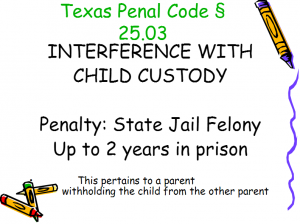 For instance, in Connecticut the criminal code is 53a-97 and 53a-98, in New Hampshire it is Chapter 633 Interference with Freedom, Section 633.4 Interference with Custody, and in Texas the criminal law that is violated when a parent refuses to give you your child in violation of a court order is under Penal Code 25.03 and is called “Interference with Child Custody.” Once you have found a similar law in your state, you can work on convincing your D.A. to change their position on interference with child custody between two parents who hold a domestic relations order. How Can I Convince My D.A. to Arrest my Ex for Violating Our Child Custody Court Order? Educate your police chief, D.A. or State’s Attorney on how much enforcing custody violations will restore the peace during child custody exchanges, reduce the number of calls the police departments and the D.A.’s office get for this problem, saving numerous tax dollars, and protecting children and first responders from the pattern of escalation that unanswered child custody violations create between two disputing parents. This will also reduce the frustration for everyone. Enforcing the laws result in lowered violent crime between high conflict parents. This relieves the frustration that the police have felt when they pass the buck to the courts knowing that many of them are telling this to a father or mother who does not have the money to go back to court in the first place. This will also raise support the D.A. and the police receive in the public. The police officer encourages the parent to comply and warns that they will be taken to jail if they refuse. The experience with this approach has been that the parents get reasonable and resolve the issue. Another example is the police document a pattern of violation, after a pattern of interference has been established (about 3 times should be sufficient to establish a pattern) that the mother or father has violated the order and refused to surrender the child to the other parent, usually the noncustodial parent. The D.A.’s office can produce a letter before they issue a warrant to give that parent one more opportunity to comply with their court orders. This letter should inform the parent of the court order and the law that they have violated, the penalty associated with the violation of the law, and notice that the D.A. intends to have them arrested if they violate the order one more time. Here is how the evidence could be gathered to help the D.A. with their investigation to establish interference of child custody. This is actually a very simple process. Some police officers just go according to what each parent says has happened and then they take this information back to Department and an investigator there decides whether a warrant should be issued. Once this warrant is issued the parent can be arrested. Or your Police Department might prefer to establish a pattern of interference. This is to help with the “intent” portion of the criminal statute. And then their Department can submit these to the D.A.’s office. The D.A. could have their counselors (assistant D.A.s), after they receive the police reports showing a pattern of interfering with court-ordered parenting time, (usually called a Standard Possession Order (SPO or expanded SPO) in Texas and called Memorandum of Opinions in Connecticut), pull the custody order from the clerk’s office or access on the computer if your D.A.’s office uses a log in method to view orders from the family court. D.A. offices are usually in the same courthouse building as your family court so getting a copy of your order shouldn’t be too difficult or time consuming. Your D.A. is going to want to develop a specific procedure for delivering those reports to a person(s) that the D.A. assigns to this project. Your D.A. might require that the police send the field reports over to them to preserve the chain of evidence. Make sure you have an extra copy of your child custody order to give to the police officer to keep. You usually only need the section that pertains to the part you are trying to enforce. Don’t bog them down with more pages and paperwork then they need. Make sure that this is an official certified copy. And make sure that this is the most recent order. Committing fraud and lying to the officer and providing orders that are not in force is criminal in itself. Once the D.A. has confirmed the violations of interference with child custody, the D.A. can get a copy of the custody order from the clerk’s office of the family court, and can issue a letter to be mailed or delivered in person to the parent in violation. Getting a copy of your court order, by the way, is pretty simple for the D.A. when the D.A.’s office is housed in the same building as the court. Once a copy of the order from the clerk’s office has been pulled, the D.A. assistant will check the terms of the court order and the offending parent identified with the supporting police reports confirming the violations. The assistant D.A. can use a form letter to inform the parent that they are violating a court order, breaking the law, and could be arrested if they break the order one more time. Some issue a citation and require the parents to go to a court hearing. This has been extremely effective since the parent has to pay a ticket and miss a day of work going to court to explain to the judge why they violated the orders. Some arrest if the parent refuses to be reasonable. Yes, there are some police out there that believe that when you commit a crime where the punishment is arrest that you should be arrested. It is a crime to intentionally withhold a child from the other person entitled to custody in all of the states that we have checked so far. What are the Results of Enforcing Custody Orders? After a few arrests or a few citations are issued, the word gets around, and fewer parents violate custody orders. The interference with child custody stops. Police get fewer calls since fewer parents deny visitation. There will be fewer parents fighting in front of the children and fewer public confrontations. This increases the trust and reliability that the children will have in the court orders that were made to protect the best interest of the child in the first place. Courts will see fewer modifications and children will have protection to their relationship with both parents without the need for more litigation. This is a win-win for everyone. Why are some of the Reasons Police do not Enforce? In many states, the police will say that this is a civil matter, and in some states police were not enforcing because the D.A. did not do anything after they enforced and so they felt like they were wasting their time and effort. Some believe that it is a family court matter and just ignore these complaints. The D.A. has to be willing to request that a court issue a warrant. It is the D.A. or State’s Attorney that is charged with investigating and prosecuting the criminal laws. So the D.A. has to be willing to take action in order for the police to enforce these laws. The police can make the warnings to the parents and issue letters themselves if they want as well. Has Anyone Been Arrested for Violating Possession Time? Yes. It is usually extremely rare though. There are many reasons for this. It may be that the police and your D.A. might have found other ways to resolve this. You will have to call your police department and D.A.s office to find out if they have found effective ways to get a violating parent to comply. Most of the time parents don’t want to go to jail, so this can be very effective when facing that possibility to getting the parents to stop interfering with your parenting time. What Do You Need Before you Call the Police to Enforce Your Child Custody Order? Before you go to the police, make sure you have the most up-to-date custody order that is certified and give your law official a copy. Find out your police department’s policy for enforcing child custody orders before you ever have a problem so if they have a policy to not enforce you know about it in advance and can start working on remedying that prior to having a problem. There are some states that will consider involving the police as harmful to the child or harassing, so make sure that you are using this option in good faith, when necessary, and as a last resort. In order for the police to apply the criminal statute there may be a requirement for them to document the interference. If the police in your city are refusing to enforce the criminal laws in your case, you might have to go to your legislator and see if one of them can help you by making a call to the police and the D.A. to find out why they are not willing to make reports on these violations. Also try your best to not expose your child to this action. The other parent might be involving the child so you will want to document this for your records in case you need it to prove the harmful involvement of the other parent to a court. (You might want to look into TalkingParent.com if you want to keep records with an electronic app where you can give access to a judge and your attorney if need be to prove when you have attempted to get your children and were refused. Documenting the violations is required for the court to enforce or hold the parent in contempt. And if the police are refusing to do anything you will need another way to document. You should still always let the other parent know when you are attempting to pick up your child and you did not get your child in writing.) Do not tell your child that you are calling the police and do not try to get your child involved with the police. It is not under your control how or what the other parent exposes your child to, but you can control how YOU do things. Even if you are afraid of the court getting upset with you for involving the police, as long as you are acting in good faith and being truthful to the police about the violation, it is better than trying to take matters into your own hands. If this becomes a regular occurrence with the other parent to interfere with the custody orders, become a member in our membership site for more tips on how to prepare so you can get the most effective results from the court on enforcement. Are there some Cheaper Solutions for Enforcing Custody in the Courts? Child custody interference can be one of the most devastating things to deal with. Parents are pushing for easier and more efficient enforcement of orders so that they can rely on their orders and reduce the destructive impact that interference has on their child’s life. Oklahoma improved their enforcement laws a few years ago so that parents can initiate and litigate the interference issue more easily and inexpensively, even when they cannot afford an attorney. Illinois writes citations. Connecticut puts parents in jail. In many states parents have been pushing for better and more consistent enforcement. Even if you find a city or county that enforces in your state, you might find several others that do not. It may be very dependent on your State’s Attorneys or D.A.’s. In Texas, parents have been pushing for better enforcement from law officials and the courts. One father recently got the court to arrest the custodial mother for 48 hours after he proved several times of interference with his custodial time with his children. The court did not change custody but this is usually enough to prevent future violations of the order by the custodial parent. Prior to that, last year, a noncustodial mother was able to get her law officials to arrest the custodial father. successfully got the court to change custody. There are several parent-run groups meeting with legislators (and their supportive staff), district attorneys, and the attorney general and the assistants to the AG working on solutions, to raise additional awareness, and to increase compliance with enforcing custody interference criminal laws. Start doing Freedom of Information Act requests to the district attorneys and Chiefs of Police to find out how often they enforce any criminal laws regarding child custody interference in their area. If your state has a criminal code then list that so they can run a search on it and supply you with how many times it has been enforced. Be as specific as possible on what you are looking for to help narrow your search. If your search is too broad they might reject your request. If your state does not have a criminal code then you might want to suggest one to your legislators, but talk to your law officials first and to the courts to find out what they think would help with enforcing custody orders. Next suggest that your D.A. and police departments consider implementing one of the procedures written about in this blog. If your county decides to try this out, make a comment below or send us a message. Moral of this story is to continue to insist that the police apply the criminal laws equally to parents as they do to non-parents and to provide you with lawful ways to address the infractions, and document and talk to your legislator if they do not. Let us know what kind of responses you are getting and how receptive your D.A. is. Let us know if you find out that your D.A., police department, or Sheriff has a different way they address custodial interference with visitation time. Updated on January 31, 2019 and again on February 3, 2019. NextOhio Court passes Equal Parenting as the Standard Parenting Plan Order in Tuscarawas County!